My second article on aerial imaging with a remote controlled helicopter is now live in the March 2014 issue of Adobe Inspire! 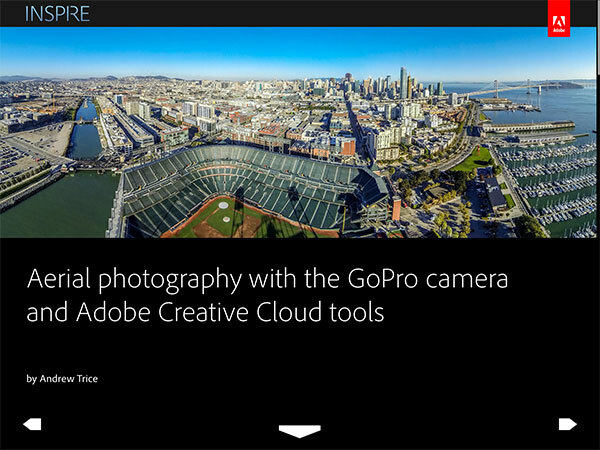 The first article focused on aerial videography and Adobe video tools. This time it’s all about aerial photography with a GoPro camera and DJI Phantom (and how to bring these images to life with Photoshop and Lightroom). You can read it on the web or download the FREE digital publication version to learn more. I HIGHLY recommend the digital publication version, which was created with Adobe Digital Publishing Suite. Be warned (AGAIN) – flying helicopters with cameras attached is highly addictive. You may easily become obsessed with the endless possibilities. If you want to learn more, definitely do not miss the Top Gun Flight Training For Hobbyist Photographers workshop at the upcoming Photoshop World conference next month! 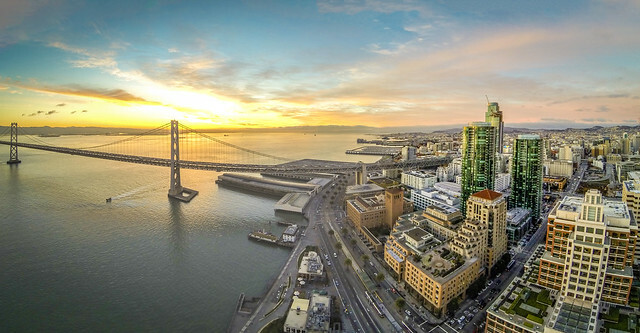 Here are just a few panoramic images I’ve captured over the last year with my copter. You can check out even more in my Flickr collection. To learn more you can read the full article online or download the FREE digital publication, and don’t forget to become a member of Creative Cloud to take advantage of all the creative tools that Adobe has to offer. I’ve been spending a lot of time with Adobe video tools lately… everything from videos for the blog, to promotional videos, to help/technical videos. Here are a few topics that beginners in video production need to think about… audio processing and color correction. First, you can make so-so video look great with a few simple color correction techniques. Second, a video is only as good as its audio, so you need solid audio to keep viewers engaged. Hopefully this post helps you improve your videos with simple steps on both of these topics. To give you an idea what I’m talking about, check out this before and after video. It’s the exact same clip played twice. The first run through is just the raw video straight from the camera and mic. Colors don’t “pop”, it’s a little grainy, and the audio is very quiet. The second run through has color correction applied to enhance the visuals, and also has processed audio to enhance tone, increase volume, and clean up artifacts. Let’s first look at color correction. Below you can see a “before” and “after” still showing the effects of color correction. The background is darker and has less grain, there is more contrast, and the colors are warmer. The visual treatment was achieved using two simple effects in Adobe Premiere Pro. 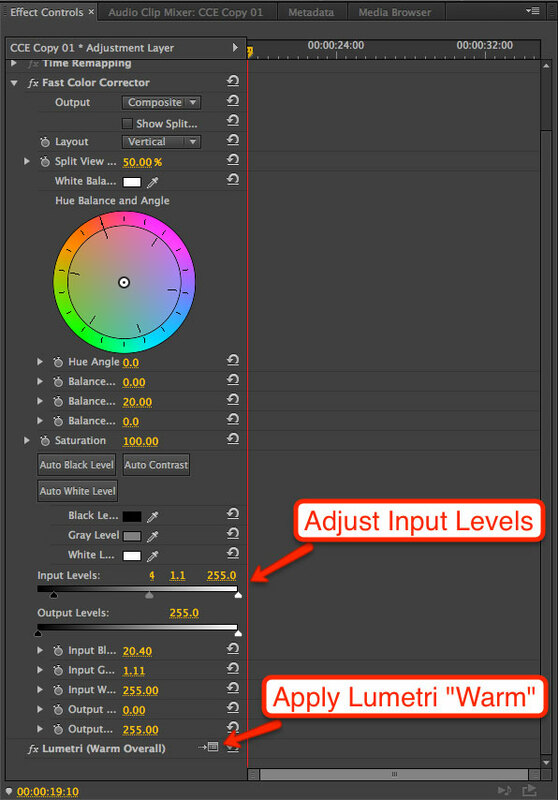 First I used the Fast Color Corrector to adjust the input levels. By bringing up the black and gray input levels, the background became darker, and it reduced grain in the darker areas. Then, I applied the “Warm Overall” Lumetri effect to make the video feel warmer – this enhances the reds to add warmth to the image. You can enhance colors even further using color correction tools inside of Premiere Pro, or open the Premiere Pro project directly within SpeedGrade for fine tuning. You can get by with a mediocre video with good audio, but nobody wants to sit through a nice looking video with terrible audio. 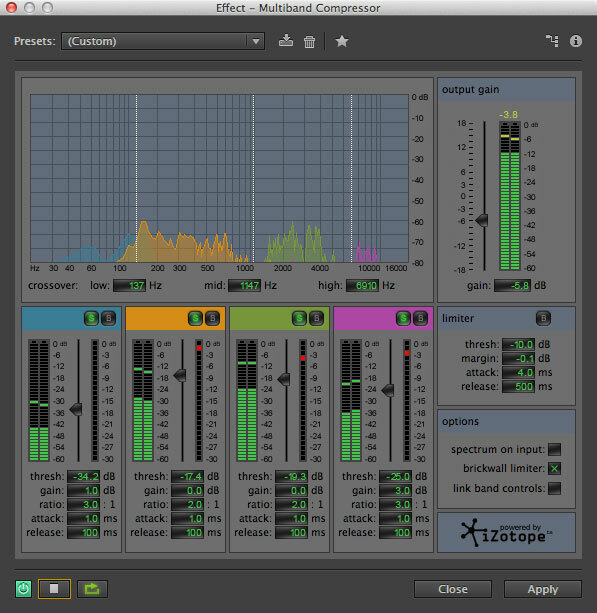 Here are three simple tips for Adobe Audition to help improve your audio, and hopefully keep viewers engaged. In this case, I thought the audio was too quiet and could be difficult to understand. My goal was to enhance audio volume and dynamics to make this easier to hear. I first used Dynamics Processing to create a noise gate. This process removes quiet sounds from the audio, leaving us with the louder sounds, and generally cleaner audio. You could also use Noise Reduction or the Sound Remover effects… the effect that works best will depend on your audio source. 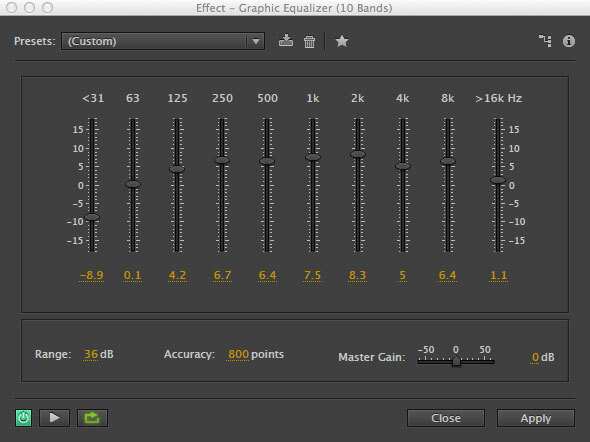 Next I used the 10-band graphic equalizer to enhance sounds in specific frequency ranges. I brought up mid-range sounds to give more depth to the audio track. 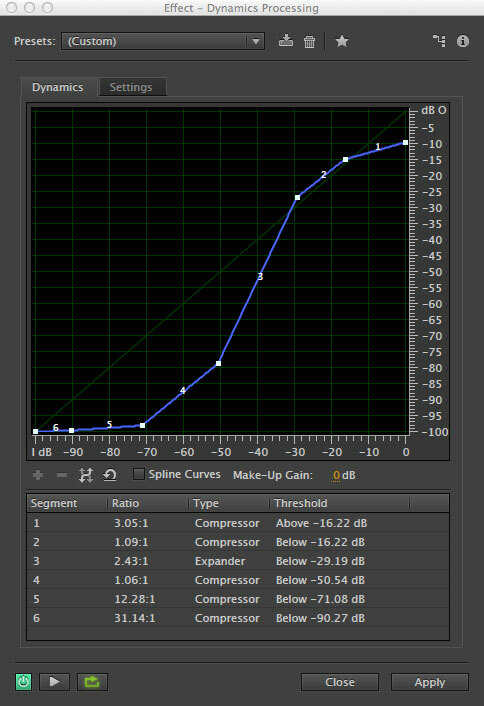 Finally, I used the Multiband Compressor to enhance the dynamic range of the audio. Quieter sounds were brought up and louder sounds were brought down to create more level audio that is easier to hear and understand. However, be careful not to make your audio too loud when using the compressor! If you’ve ever been watching TV and the advertisements practically blow out your eardrums, this is because of overly compressed audio. Want to learn more? Don’t miss the Creative Cloud Learn resources to learn more about all of the Creative Cloud tools – the learning resources are free for everyone! If you aren’t already a member, join Creative Cloud today to access all Adobe media production tools.